As a clown I am always on the look out for funny jokes, so I thought I would share some of the funniest, corniest, and giggle worthy jokes with you from time to time. They will always be family friendly, and hopefully brighten up your day. So here is my first Joke In A Box! This entry was posted in Jokes and tagged Children's Entertainer Bridgend on April 9, 2015 by Mr.T.Ricks. What a fantastic two days I had at the Caerphilly Garden Centre spring festival event. Lots of people came to visit the garden centre, and while the adults were checking out all of the special offers, I was entertaining the young ones. Children had the choice of a balloon animal, face painting, glitter tattoo or all three! 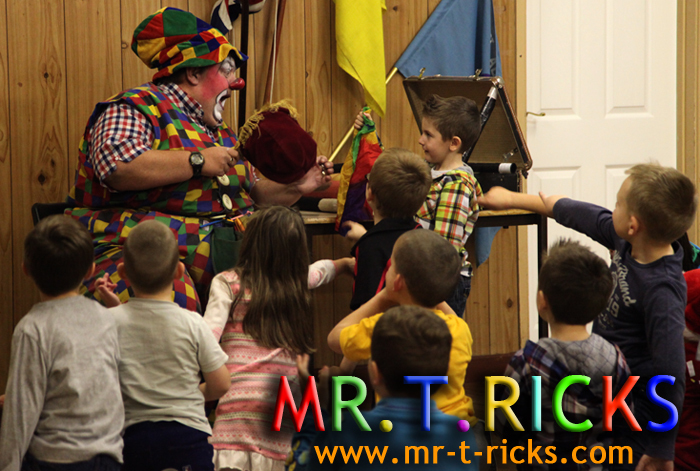 We were also lucky to have my good friends at Red Dragon Magic performing a range of tricks which proved very popular with both the old and young. In-between all the fun there were supplier representatives on hand giving great advice on the new spring range of plants and shrubs, and also plenty of staff, with their wealth of knowledge, helping anyone who needed it. I also had a visit from my new best friend, Lola, who came to say hello, and got a glitter tattoo and balloon. You can read all about this lovely little girl here. The onsite restaurant at the centre is fantastic – providing lovely hot food and drinks, and was very busy around lunch time (on both days) so obviously I am not the only one who loves their food! While exploring: I got bitten by a venus fly trap, rode a donkey, made some new friends, and had a big kiss on my big red nose from a lovely young lad by the name of Luke. (Kept an eye out for Darth Vader – thankfully he did not turn up). You can see some of my adventures below. All in all it was a very enjoyable few days and can’t wait to go back. I will of course post when I am back at Caerphilly Garden Centre, and hope to see you all there. 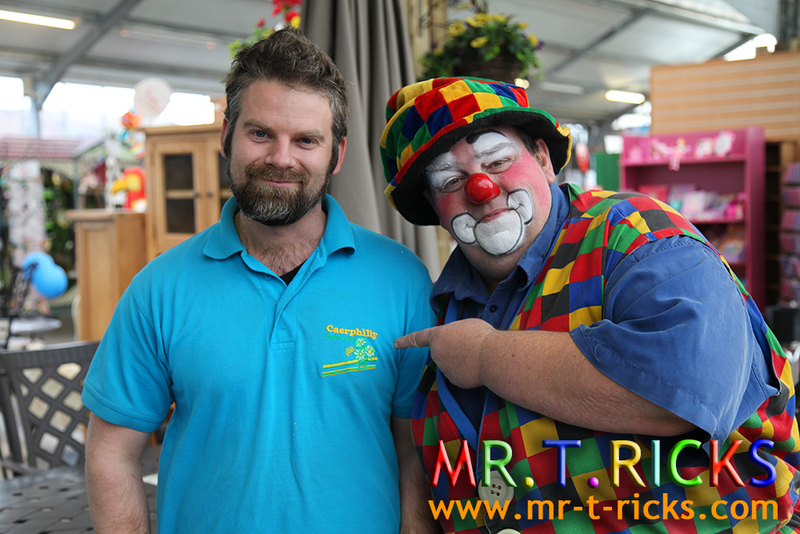 This entry was posted in News and tagged Caerphilly Garden Centre, Children's Entertainer Caerphilly, Clown, clowning, Mr.T.Ricks on March 14, 2015 by Mr.T.Ricks. Recently I blogged about the Fear of Clowns which gained a lot of interest both here, on my blog, and my fan page. This fear was brought to my attention yet again on the weekend, while I was attending a birthday party which included fairly young children. At one point I noticed a little girl sat on her grandmother’s knee, who seemed interested in my appearance, but looked incredibly shy. Using my quietest voice I asked if she would like a balloon model, and she said yes. A picture was taken (which you can see below,) and at this point I sensed that she might be afraid as well as shy. After this I was careful to make her feel at ease, and over the course of the party her confidence around me grew. 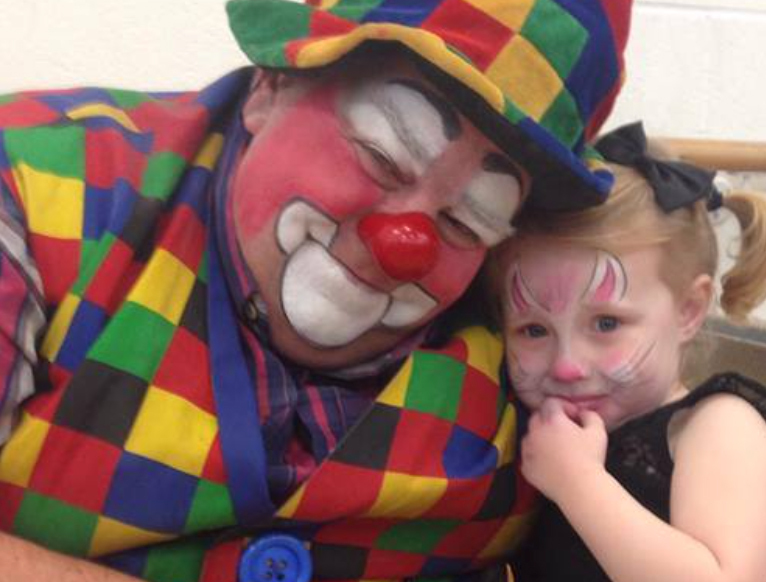 This of course has made my day that a little girl can now grow up enjoying clowns, and not fearing them. Her grandmother has also mentioned that if her confidence continues they would like to have me back for her party, and I cannot wait. 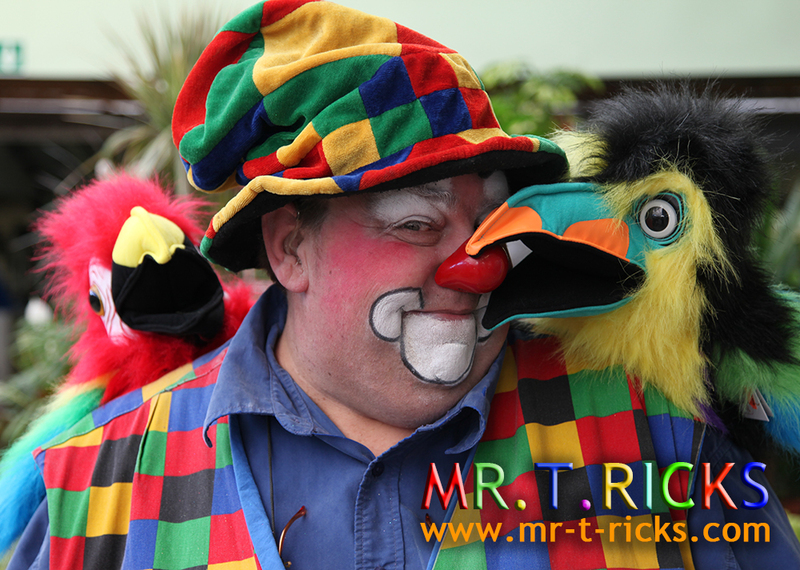 This entry was posted in News and tagged birthday party, Children's Entertainer Bridgend, Children's Entertainer Caerphilly, Clown, Mr.T.Ricks on March 2, 2015 by Mr.T.Ricks. Why I charge what I do. 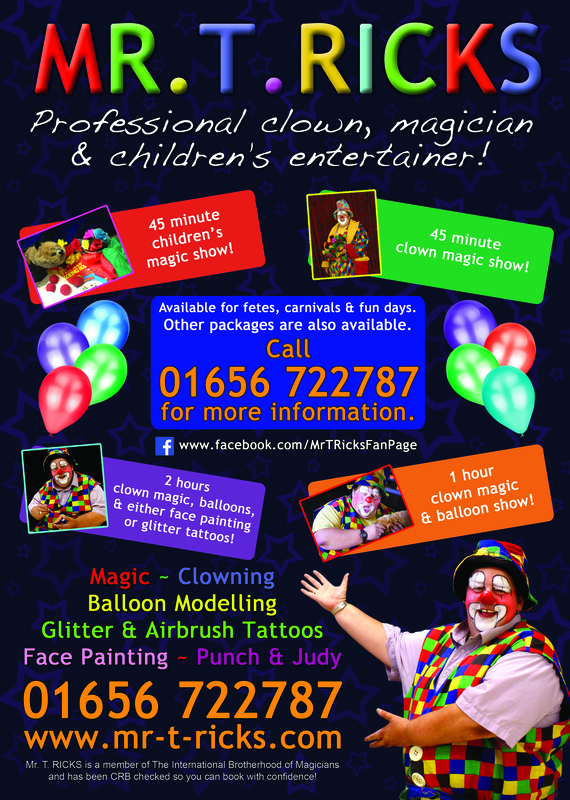 Hello everyone, While out and about in my clown car the other day, I spotted a notice in a shop that I would like to share with you all as I am occasionally asked why there are other children entertainers that charge more or less…. 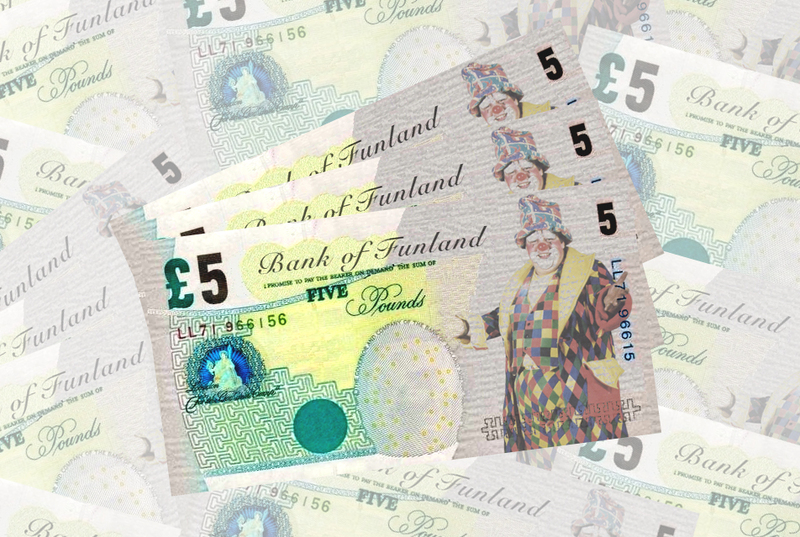 So let me tell you why I charge what I do…….. I am a professional children’s entertainer. That means this is my business and my main source of income. This is not a second job, and I don’t just work weekends. I work 7 days a week 365 days a year. (Yes, I have worked many a Christmas Day) For me clowning is a serious business. When I am not performing I am either practicing routines, working on jokes, or keeping up with the latest trends. In the past I have even asked for footage of my performance, filmed at a birthday party by a family member, so I can evaluate the show from a spectator’s viewpoint. …and then there are the props! I am constantly buying new props to replace those that get worn through age, or wear and tear (and for those who have seen my act some of these get deliberately whacked about. :-p) This helps keep the act looking professional and presentable. I am now in my 23rd year of being a professional children’s entertainer, and I’ve had many imitators, but I have always seen these inferior performers come and go when things get tough. So the next time you want to build childhood memories for your child, or make everyone laugh and smile at a once in a lifetime event, ask yourself: why do some so called ‘children’s entertainers’ need to charge so little to secure their bookings? 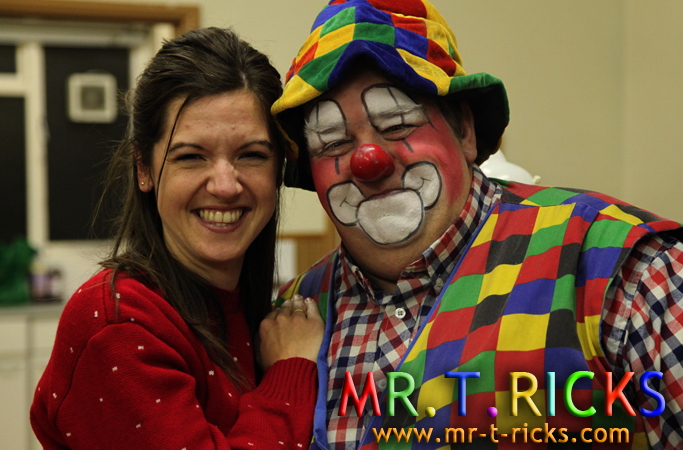 I am Mr. T.Ricks – professional clown, magician and children’s entertainer. 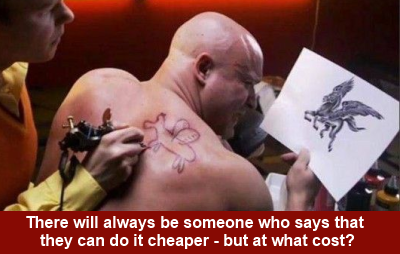 My prices are competitive for the quality service I provide, and although I may not be the cheapest… I would rather be the best. 🙂 Bye for now… Mr. T. Ricks. This entry was posted in News and tagged Children's Entertainer Bridgend, Clown, cost, fee, Magician, Mr.T.Ricks on February 13, 2015 by Mr.T.Ricks. 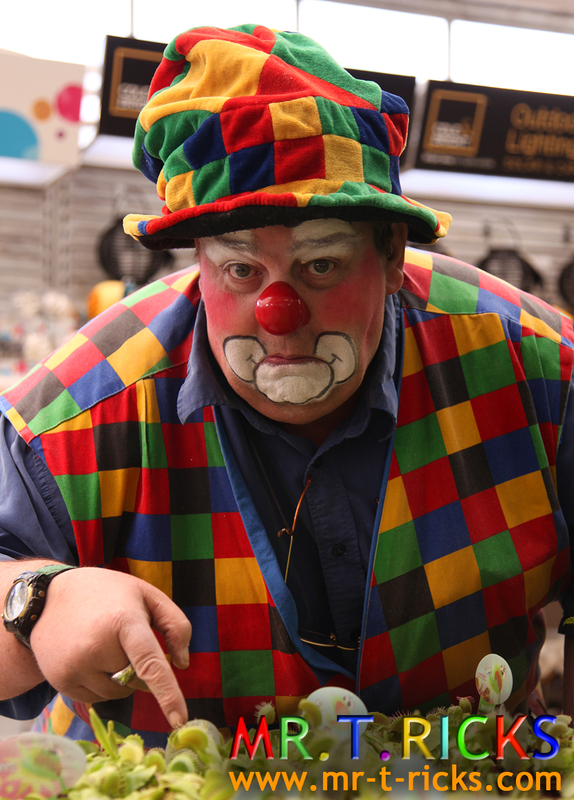 Fear of Clowns – It’s no laughing matter! In my last post you might have noticed that I mentioned the word Coulrophobia. For those of you who don’t know Coulrophobia is the fear of clowns! This is a very real phobia and can easily be present in adults even more so than children. Those of you that follow me on my fan page will know that I have even spoken on BBC Radio Wales on the subject, which was a little tricky for Steffan Garrero who just so happened to have this phobia. Naturally, I am saddened to hear that people have this phobia, and do whatever I can to try and put people at ease – especially if they happen to be at my show! 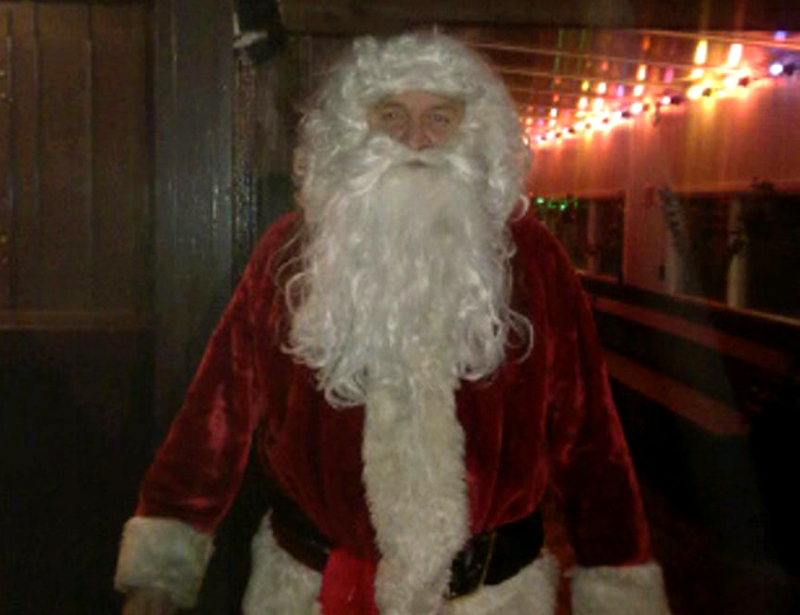 This just so happened to be the case when I attended the 1st Abercarn Beavers Christmas party in December. A lovely lady by the name of Kelly (who is a helper at the group) has been Coulrophobic since a child and had no rational explanation for her fear. This phobia was so great that she wasn’t even going to stay at the party, but was persuaded to help at the back of the hall where she could hide in the kitchen if she wanted to! Fortunately this was quietly mentioned to me at the start of the show and I was able to perform my routine down the other end of the hall, while Kelly watched surrounded by all the other leaders. and so she should be! – Well done Kelly! If I am attending one of your events and you think someone at the party has a fear of clowns then please let me know in advance and I will do my very best to put them at ease during my time there. 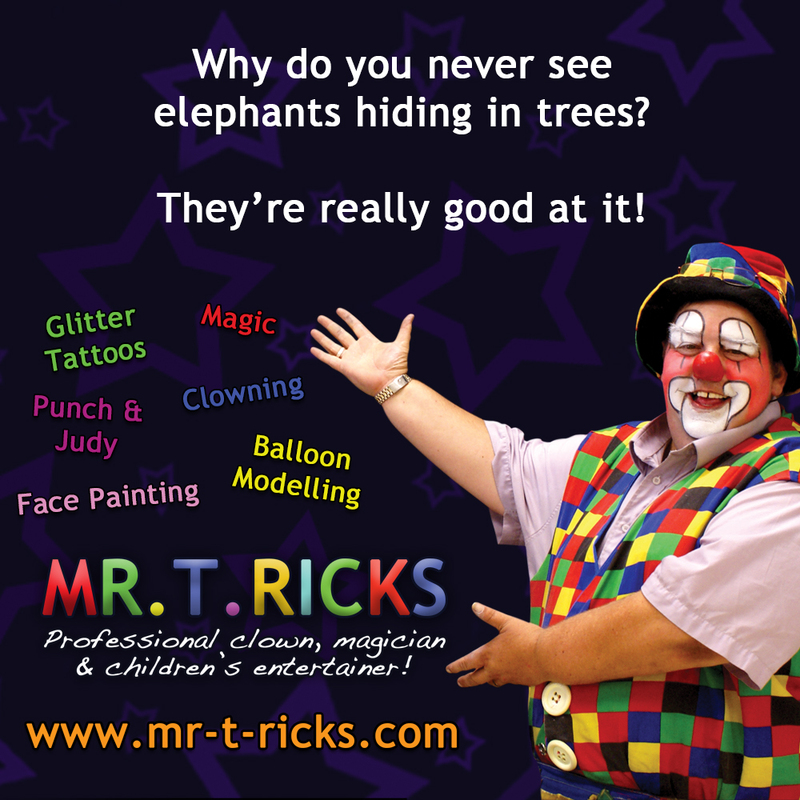 Alternatively you can now book my children’s show, without the clown element, and you’ll still get Mr.T.Ricks the colourful magician turning up to entertain your guests. Just get in touch via any of the methods on the contact page for more information. 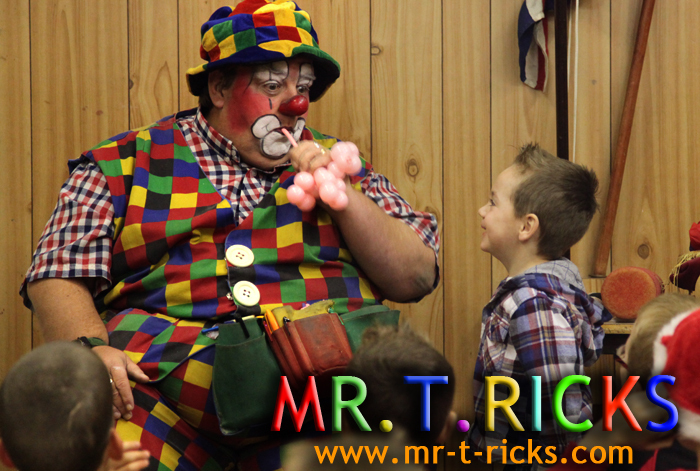 This entry was posted in News and tagged balloon modelling, Children's Entertainer Bridgend, Clown, fear of clowns, magic, Mr.T.Ricks on January 18, 2015 by Mr.T.Ricks. These are just some of the total packages available, but if you would like to know about all of the packages, or require more information about the ones below please feel free to get in touch for a chat. 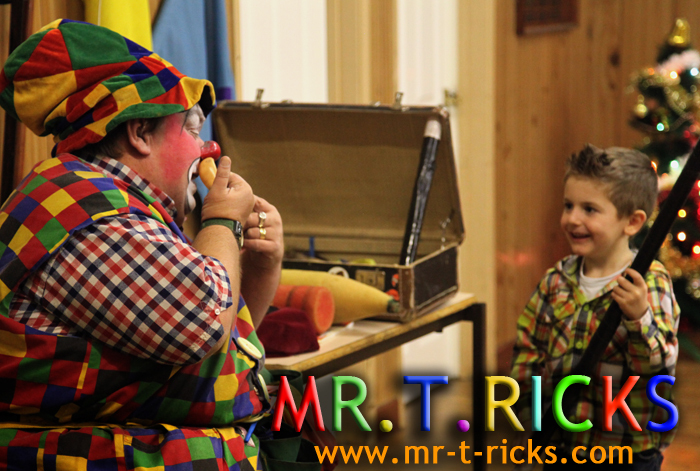 This entry was posted in News and tagged Children's Entertainer Bridgend, Clown, magic, Magician, Mr.T.Ricks, parties, party, shows on January 16, 2015 by Mr.T.Ricks.